What Is the Connection Between Diabetes and Dizziness? Is there any connection between dizziness and diabetes? Diabetes and the members of their family have to realize that a major symptom of diabetes is dizziness and it is important to have this complication treated immediately. Therefore, here is the opportunity to find out the reasons for dizziness to happen to diabetics and the treatment for the problem. It is from carbohydrates that the body gets its glucose and this glucose is then changed during metabolism into energy by the cells in the body. Blood glucose levels increase due to the intake of food and this stimulates the pancreas to release the hormone, insulin, to help the cells of the body to take in the glucose. In this way, insulin does the work of regulating the blood glucose levels. However, if the cells are no longer sensitive to insulin or insufficient insulin is released by the pancreas, blood sugar levels will remain high. This health problem is known as diabetes. And one of the diabetes symptoms is dizziness. When raised blood glucose levels are noted, the problem is known as hyperglycemia while low blood glucose levels are known as hypoglycemia. The continuous changes in the levels of blood glucose are much greater in a diabetic than in the usual healthy individual. Both, too high as well as too low, blood glucose levels can cause dizziness. A diabetic’s blood sugar levels can drop too low if the person takes too many oral tablets, inject too much insulin or misses a meal. It can also be a side-effect of particular medicines. When nerves are damaged as a complication of diabetes, it is called diabetic neuropathy. As a result of diabetic autonomic neuropathy, low blood pressure, fast heart rate, dizziness as well as unconsciousness when standing up too fast can be experienced. Too much consumption of alcoholic drinks without the accompaniment of food can lead to hypoglycemia which can cause confusion and lightheadedness or dizziness. For the brain to function properly there must be a sufficient and constant glucose supply. Not enough or inconsistent glucose supply to the brain can lead to speech difficulty, nervousness, weakness, sleepiness, shakiness, sweating profusely, confusion, anxiety, dizziness and fainting. The family members and friends of the diabetic have to be informed about these symptoms so that they know the diabetic has to be given sugar containing foods, sugar or a glycogen injection as soon as possible. Such immediate treatments save the diabetic’s life. Without the treatment, the diabetic can have seizures before coma occurs. Death can result from serious hypoglycemia. Hypoglycemia can happen while a diabetic is asleep. Such a person may shout at the top of his voice while having nightmares. Due to too much sweating, his bed sheets and clothes may be damp. He may show much irritability, very tired and confused upon awakening. The people around him have to be aware of such symptoms. Unlike insulin which assist to reduce the level of high blood sugar; glucagon, another hormone from the pancreas, assist to raise blood sugar levels whenever they drop below the normal range. Glucagon helps to break down the liver’s glycogen to send glucose to the bloodstream. A faulty glucagon response can be the cause of hypoglycemia in some people. Diabetics ought to make sure their medicines are available for use and learn to make changes in their medications to accommodate for routine or schedule changes. 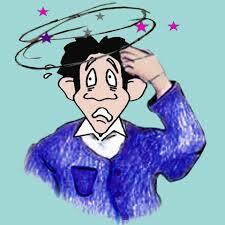 Another common cause of dizziness is high blood sugar levels or hyperglycemia. Blood sugar levels stay high if insufficient insulin is produced by the pancreas. High levels of blood sugar are also present when body cells develop insulin resistance. This resistance towards insulin happens in type 2 diabetes and, under such circumstances, the pancreas produces even more insulin in an attempt to have the blood glucose levels under control. When blood glucose levels eventually drop, there are continuous changes in the blood glucose levels and this causes hormone imbalance. The overworked pancreas finally fails and insufficient insulin production leads to raised blood sugar levels. Hyperglycemia can lead to anaerobic metabolism and dehydration. It can also cause changes to acid-base balance which is a severe condition known as ketoacidosis. Many metabolic functions are affected by high blood glucose levels and they can lead to dizziness and fainting. Raised blood glucose levels can show symptoms such as dizziness, fatigue, blurred vision, great thirst, and dry mouth. When the glucose level is excessively high, there can be breathing difficulty and coma. An individual given the diagnosis of diabetes have to take medicines prescribed by the doctor. He ought to do regular exercise and go on a low glycemic diet as both of them can help prevent blood glucose levels from fluctuating. Diabetic medicines can be used to treat dizziness and diabetes. Dizziness can be prevented by keeping the blood glucose levels within the safe range through some changes in the diet and lifestyle, if the condition is not serious.